Well, I guess the April Fool’s joke was on us with that snow storm! I believe we received 15 inches this time and it certainly wasn’t as light and fluffy as the last one. I understand from Dana Dolloff, who skied before church on Sunday, that it was delightful! Of course, the weather necessitated some cancellations. Actually, it turned out to be only a delay for John Wheeler’s birthday party at Gill Home. His birthday is 4/1, but the celebration was postponed until Sunday. Hopefully I will have pictures for next week. This unpredictable weather has been a challenge for sugaring. We were able to boil on Sunday and then have “sugar-on-snow”. Believe it or not, Tom and I had never made it, but grandson, Owen showed us how. 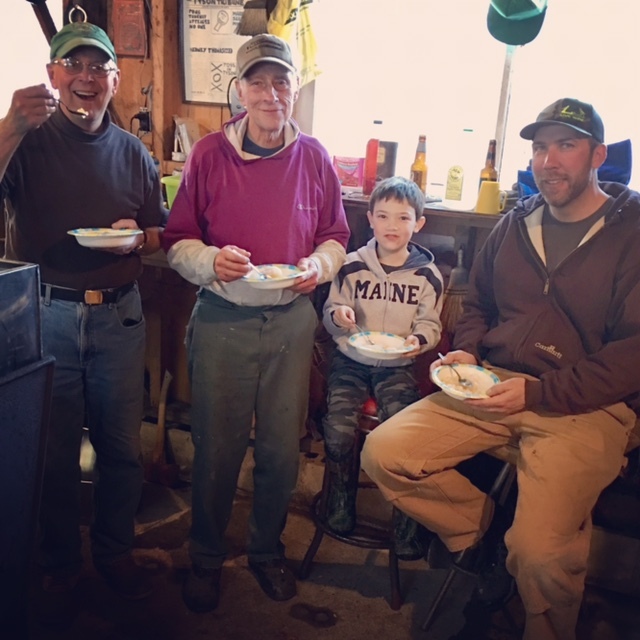 The picture is the proof – Eric Johnson, Tom, Owen and Chris Perrino enjoying this sweet treat! Please note that on Saturday April 22nd, 2017 there will be a free presentation by Senior Solutions at The Plymouth Community Center at 11 AM. Senior Solutions is one of five Area Agencies on Aging (AAA) in Vermont and can provide a wealth of information about programs and services. Come and learn what is available! This entry was posted in Community News and tagged Plymouth Community Center. Bookmark the permalink.